Jewelry has the extraordinary power to not only make you look magnificent, but to make you feel truly special in a way nothing else can. 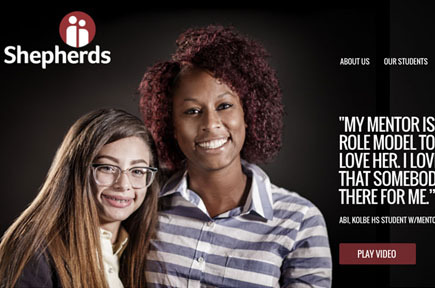 We were humbled to work with the passionate and giving folks at Shepherds to create a compelling site and videos for this extraordinary inner city mentoring program. “Changing Lives… One Student at a time” is truly possible, as is witnessed in the heartfelt testimonials and personal stories gathered for this site. Set against the iconic mid-century modern homes and surreal mountain backdrops of Palm Desert, “The High Style Life” invites you to “Live to Dress” and “Dress to Live.” “Dress for Drama,” “Dress to Intrigue,” “Dress for Yourself.” This spring, we celebrate the artistry and self expression brings to our lives. This season, Mitchells stores welcomes famed Pacific Northwest retailer, Marios to their Family of Stores. Run by Mario Bisio, a longtime friend of the Mitchell family, Marios’ includes three exquisite Mens’ & Womens’ luxury retail stores in Seattle, Portland and Bridgeport Village, Oregan. Marios’ Style Guide, sets their extraordinary fashions against the majestic mountains and iconic Mid-Centurty homes of Palm Desert, California. Marios’ distinctive edit of designer fashions will now be integrated into mitchells.com, adding more variety for all of their customers! Open “What a Girl Wants” and discover the most exquisitely curated collection of fine and designer jewelry on the planet. This catalog features moody and emotive shots of jewelry worn many ways and takes the reader on the clear path to any girls’ heart… and the only place to find it. Fall 2015 found us celebrating 50 years since San Francsico fashion pioneer & icon, Wilkes Bashford opened his first store in Union Square. We look back at 50 colorful years, in which Wilkes famously dressed countless friends and celebrities of the arts, sciences, technology and political word in the Bay Area and beyond. “Dress Like You Mean It” invites our customer into a world where fashion is taken seriously. Set against the backdrop of one of America’s finest Gothic Revival mansions, stately dressing abounds, for a season filled with social events, arts, holidays and exquisite everyday life. Don’t be afraid of full-on glamour. Sometimes more is more! Pink Aid is a 501C organization, co-founded by wsaa principals Amy Gross and Renée Mandis, with Amy Katz and Andrew Mitchell-Namdar. Pink Aid’s helps underserved women across Connecticut and Long Island survive breast cancer treatment with support and dignity and provide screening to women in financial need. “The Well-Versed Life” explores and celebrates the power of fashion as an art form, through the words of Latin America’s great thinkers and many of the world’s great artists of varying disciplines. ©2014 WSAA, Inc. All Rights Reserved.